Kids love cheese. That is a fact. I think most adults love cheese too. Cheese just makes everything taste better….even vegetables. 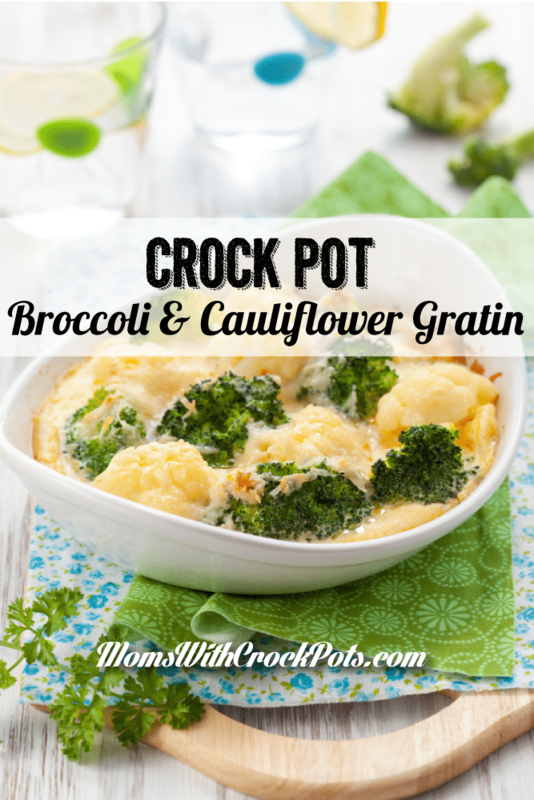 If you have picky eaters try this Crock Pot Broccoli & Cauliflower Gratin Recipe to get those veggies in. This makes a great summer lunch or dinner side dish. Grease your 4 qt crock pot. In a large skillet, heat 2 tablespoons of the oil over moderate heat. Add the garlic and crushed red pepper and cook just until fragrant. Off the heat, add the broccoli and cauliflower and toss. Toss half of the cheese with the vegetables. Transfer to the crock pot and sprinkle with the remaining cheese. In a small bowl, toss the crumbs with the remaining 2 tablespoons of olive oil; season with salt and pepper. Sprinkle the crumbs over the cheese.